From time to time I just blast tweets about software development, project planning, team dynamics, or whatever else comes to mind. Here is a synopsis of recent tweets and rants. If you want to follow the conversation follow me at techknow and/or juixe. Kids lunch snacks sound like Java interfaces, Uncrustables and Lunchables. 99% of software is hardcoded defaults. Software will shape the future. I don’t count lines of code. Code less, debug even less. Success is a dish best served with champagne. Don’t let circumstance beyond your control control you. Just because it’s widely accepted that Steve Jobs was difficult to work with and a genius doesnt mean you have to be difficult to work with. Negativity is like cholesterol, to much of it can kill you. Most important lesson in my life: Learn to appreciate what you have and do not agonize about what you don’t. Corporate titles mean nothing, that is why I put Chief Creative Business Developer Principal Program Scientist on my business card. The biggest lesson one can learn is to listen. The universe doesn’t hate you, it doesn’t even know you exist. Try harder. Do better. Go further. Think Bigger. Forget stopping to smell the flowers, I stop to reach for the stars. I’m going to start a search engine for ego searches and call it egoogle. Google is a giant keyword router in the cloud. Android uses food related codenames for its different versions, such as ice cream sandwhich. I hear next release will be named leftovers. Why is Gingerbread still the most popular/common version of Android In new phones? It’s like two releases behind latest version. I think it is safe to say that G+ is a successful flop. I would compare it more to MySpace than Facebook. Missing Feature: I wouldn’t be surprised if the Kindle reader would allow you to tweet a quote right from an eBook. If Apple would design single family homes it would cost over $1 million and only be 800 sq/ft but I would want one really bad. iPhone or iMole: whatever data or contact or image you have on your iPhone some hacker, service, API, law enforcement, or app will access. In today’s day and age, no person should be executed for tweeting and no person should have to go to jail for downloading a song. Blue Ivy Carter sounds more like a brand name of vodka or energy drink put out by Jay-Z than the name of his kid. Who needs $3 million to run a WordPress-powered tech blog? At these valuations my blog is definitely worth $10 million. Silicon Valley entrepreneurs are modern day alchemists turning virtual goods into real cold hard cash, IPOs into billions. A frothy market is a tasty market. The future is in crowd financing. All the people of Palo Alto rejoice at news of Facebook IPO, in a few months their rents will go up 30%. To much Facebook IPO analysis on my feed. If you aren’t a preferred investor you ain’t making money. 1. _________. 2. $#%#%$*(&. 3. ?????? 4. Profit. Can software refactor the world? How can people wave their constitutional rights be agreeing to a terms of service they didn’t read or understand? Who will be the Bill Gates and Steve Jobs of 3D printing? Forget “where’s the beef,” where’s the 100 Mbps broadband? If corporations are people does it mean a man can marry a corporation? Recently at a iOS development meet up the presenters from Qubop showed a powerful slide from their presentation that quantified the mobile app user life cycle. It is estimated that on average after one day of usage, 38% of the users will stop using a mobile application. After a week, the percent of users that will still use the app drops to 50%. After 6 months, you are down to 10% of users still using your app in some capacity. Because of the half life of mobile application users, app developers are constantly updating their mobile apps. It depends on the number of apps you have on your phone, but if I don’t get the latest apps in a weeks period I would have 15 app updates waiting for me. I update one day and the next day there is another app ready to update. Because apps are updated so often, and they require the users permission to do so, mobile app users have are developing app update fatigue. Recently I noticed that I had less than 3GB of free disk pace on my laptop. I have and take a lot of photos, in addition to that I download and install a lot of different development tools and IDEs. I also have a lot of music and listen to a lot of podcasts. In addition to all this, I am a digital hoarder and download and save any PDF or image that I find interesting. When I discovered that I was running out of disk space I immediately started to look for “disk space” apps on the App Store. I found Spacie to be what the HD DR ordered. With Spacie I found that I had multiple version of NetBeans each taking close to 1GB. I had multiple versions of the Android SDK each taking close to 1GB. Spotify was caching over 2GB of data. I found that iPhoto and iTunes was taking the bulk of the space. I easily had 20GB in iPhoto and 40GB in iTunes. In iPhoto, I started to export and backup photo sets older than a year or two so that I could reclaim more space. In iTunes, I found that I had a hundreds of podcasts taking over 100MB each. I pushed these photo sets and podcasts to an external hard drive and reclaimed over 40GB of disk space. Spacie helped me to identify what files where taking the most space and I systematically addressed each folder as best I could. 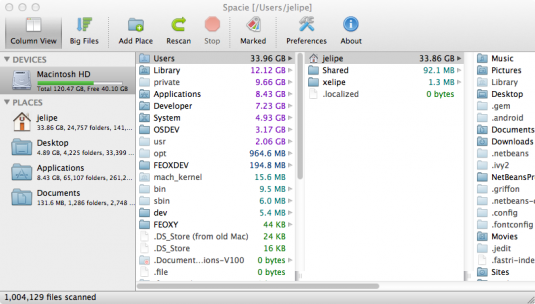 Spacie finds large files in your hard drive and helps reclaim disk space. Spacie is available on the Apple App Store. It is currently priced at $1.99 and it’s well worth it since it saved me from having to upgrade to a new hard drive. This geek gift guide is not so much for geeks and techies but for those that have geeks and techies in their life and need a little help in finding the right geek gift this holiday season. If you want to wow the geek in your life with the latest technology gadget you need to look no further. For two years straight the iPad has been the most coveted piece of technology on most self respecting geek. The iPad is great for geeks no matter their expertise, music, photography, gaming, social media, etc. A geek that travels a lot or enjoys reading on their iPad when at a coffee shop would enjoy the 3G iPad so that they can always be connected no mater where they are. 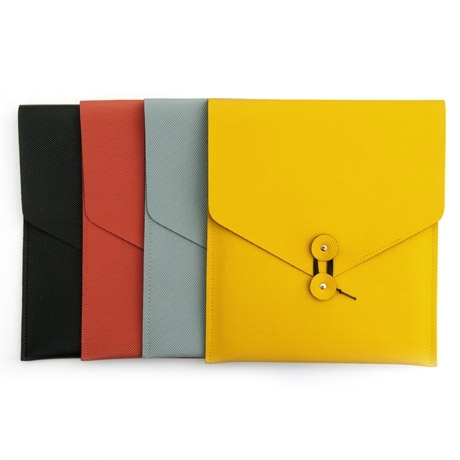 Whether you give the geek in your life an iPad or if they already have one, there are a ton of great accessories, such as a envelope iPad cases from Poketo. Over this last year there has been an explosion of tablets come into the market such as the Amazon Kindle Fire, and Barnes and Noble’s Nook Tablet. The Nook tablet at $249 is a great bargain but so is the Amazon Kindle Fire at $199. The Nook tablet is a bit faster and more powerful than the Kindle Fire, but if you already own a Kindle or have purchase Kindle ebooks then the Kindle Fire would be the obvious choice. For the financial whiz in the family I would recommend the HP 12c Financial Calculator. The HP 12c Financial Calculator has a retro HP look and over 120 mathematical functions that would be appreciated by any business and finance power user. Every engineer needs a notebook and there are no better notebooks than Moleskine notebooks. Moleskine has come out with a limited edition Star Wars notebooks perfect for that die hard fan. For the old school video gamer in the family, they also have a limited edition Pac-Man set. As everyone already knows, the standard geek uniform is jeans and a t-shirt. Any self respecting geek needs to have some ThinkGeek shirts in his wardrobe. ThinkGeek gear is like Armani Exchange for geeks, binary fashionable and geek chic. I’ve been an Android user since the HTC G1 first came out. Since then, I’ve had and used the Google Nexus, HTC G2, and the Dell Streak 7. I’ve tried to like my Android devices but they lack polish or frustrate me in several other ways. The first annoying lack to details is noticed immediately as soon as you un-box the device. Just turn over the device and you’ll see three or more logos, the maker logo (such as Dell, HTC, or Samsung), the carriers logo (T-Mobile or Verizon), and the product name or other insignia. Apple products just have the Apple logo. On Android devices, you’ll have different logos each placed on the back plate separately, the vendor’s logo will be etched into the back while the carrier’s logo will be some cheap vinyl sticker placed afterward. My personal pet peeve with Android devices is the craziness with moving apps from the internal device’s memory to the external SD card. Even relatively recent Android devices such as the Google Nexus and Dell Streak 7 have less than 1GB internal memory so if you download a lot of apps you’ll soon need to move apps around to the SD card. But some apps you can’t move to the SD card so that presents a different issue. Who cares if the phone’s memory can be extended by using higher capacity SD cards if a one year old device can’t even be upgraded to the latest Android version. So the whole thing with extensible SD cards and moving installed apps from the internal memory to the SD card I find completely and frustratingly useless. The whole concept of an Operating Systems is that best manages the resources of the device, the Android OS should best manage installed applications in either the internal memory or SD based on some intelligence. Why am I doing Android’s job? Another concern I have with Android devices is that they usually come with a lot of pre-installed apps. For example, my Dell Streak 7 came with Kongregate Arcade app which I can’t remove and reclaim the wasted internal memory. Similarly, carriers and vendors add and customize Android so that no two devices have the same user experience. I’m currently prototyping an iPad application and I’ve just found working with jQuery Mobile and PhoneGap to be a breeze for mobile application development. I’ve used iOS SDK before and I’ve experimented on test applications with Android and I’ve always found issues with both the iOS and Android development frameworks. I’ve also looked into cross platform mobile development toolkits such as Appcelerator Titanium and Sencha Touch but I found these were not of me at the time. Any of the aforementioned platforms and frameworks can be used to create a great looking and functional mobile application but I found that they each ask the developer to make a trade off. Because a jQuery Mobile application is just a HTML5-based web application, if your an run it on your iPhone or other mobile device using the native web browser. On the iPhone, when you run a jQuery Mobile application the browser will take up a small portion on the screen for the navigation buttons, bookmarks, and other controls of the browser. One way to claim all of the screen real-estate is to create a native application, that is where PhoneGap comes in. PhoneGap is a native shell around a web application, such as those developed in jQuery Mobile. With PhoneGap, you can turn your jQuery Mobile application into a full fledged native application.